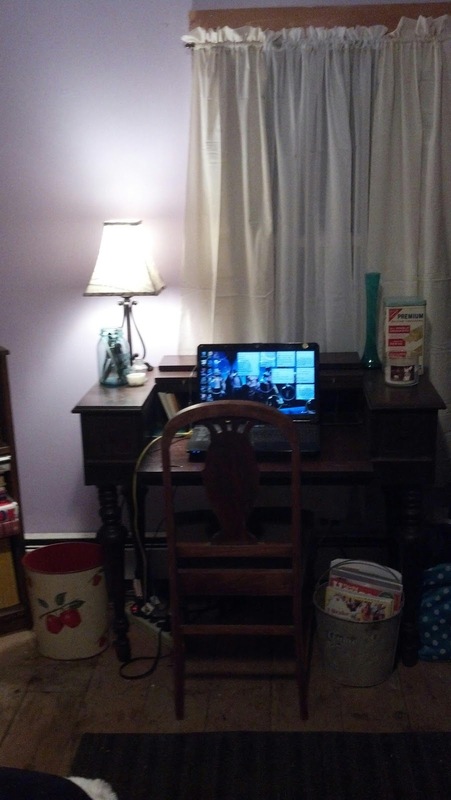 Yesterway: It all started with a desk. I accidentally started out the New Year with some big changes. To begin with, I have to mention that my room used to be horribly outdated - and by outdated I don't mean classically vintage - but stuck in my tweeny decor from 6 years ago when we moved into this house. It was getting old and I longed to change it, however I was completely aware that it was to be a big job so therefore I kept putting it off. Well, on a recent trip to my grandmother's, I came home with a beautiful antique spindle writing desk. You can bet your bottom dollar I wanted this lovely in my room. So it began. Apologies for the awful phone pic. Thrift finds include the trash can, blue jar holding pens, saltine tin, chair, and bucket beneath holding magazines. None of which cost above five dollars. I had to move out my old computer desk as well as my ancient desktop computer. Taking advantage of the opportunity, I rid out all my clothing and sent two full bags off to Goodwill. In addition, several other bags were sent off in the trash of things which I at present have no clue why I kept so long. After the long and agonizing clean out process, I finally got to move on to the fun stuff. Keep in mind, this all had to be done on a small budget. I worked with all my existing furniture aside from the desk switch out. To begin with, I purchased new curtain rods as well as some sheer panels. Then in an effort to save money, I made some rough curtains using unbleached muslin. By taking this option, it cost me about a quarter of what it would have to purchase them. I splurged on some small details including a new switch plate cover, coat hook, lamp, and shade. 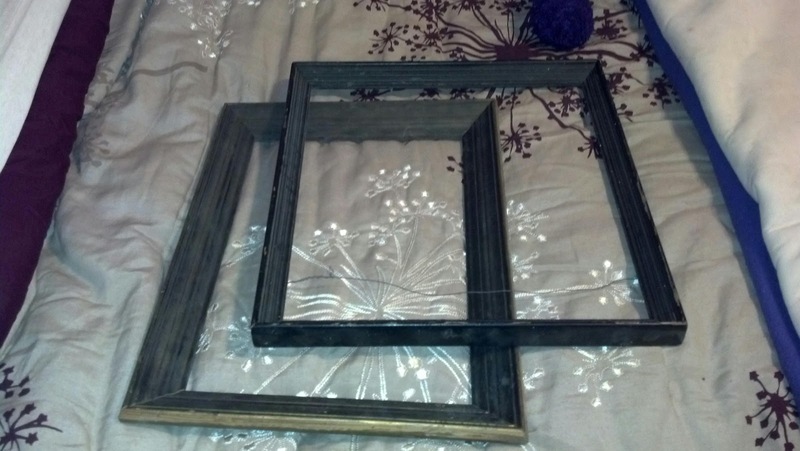 In order to wrangle some of my random clutter, I purchased some wooden crates from The Home Depot for around $8 a piece. Not too shabby all stacked together in my opinion. All the vintage pennants were flea market finds for under three dollars a piece. My biggest purchase involved new bedding. Although I was hoping to put this splurge off awhile in order to save, after checking online, I decided that this was definitely the bedspread I wanted and I didn't want to miss the opportunity and have them discontinue it. Therefore, I gathered some guts and got the bedspread, shams, bed skirt, a new sheet set, as well as a couple new fluffy pillows. Now that's it's all in my room, I'm happy with my decision. 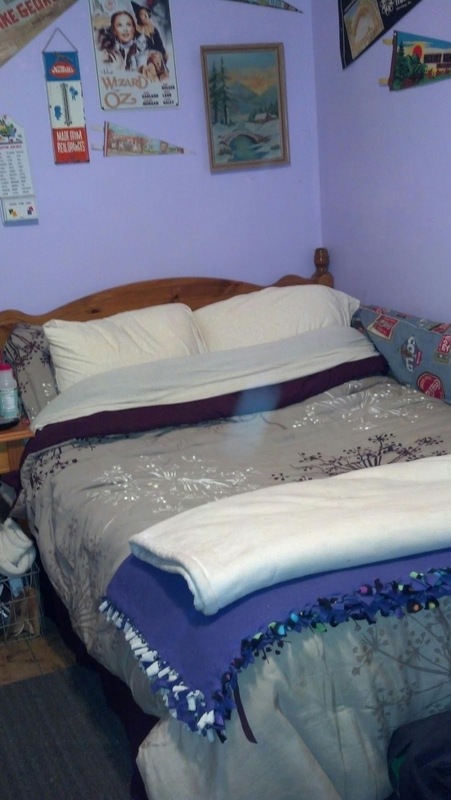 The sheets perfectly match the curtains and the flecks in the muslin are also reflected in the comforter. The best part was that I was able to accessorize with some of my accumulated thrift finds. 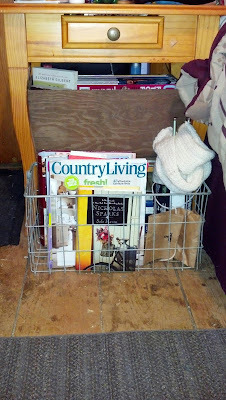 The crate was amongst my junking finds from my mom's and the basket was a two dollar flea find. 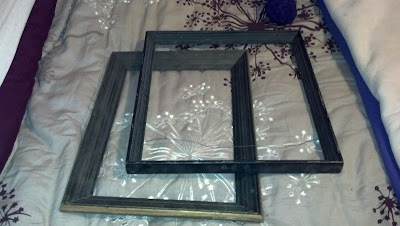 The last thing left on the to-do list is to come up with some awesome wall art...and this is what I'm working with. Hmmm, I think it has possibilities. Overall I have to say I'm quite pleased with the transformation. It definitely is more fitting now! It's so nice to have a change' it makes all the difference! Most definitely! I can't believe how much better I feel relaxing at home now! Tip-Top and to the Thrift Shop! Not With a Fizzle, but With a Bang.